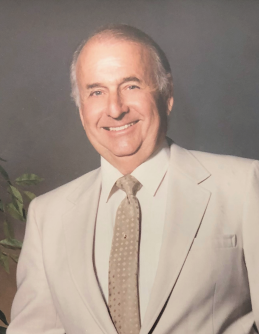 James A. Moutray, 88, of Carlsbad, New Mexico, passed away Thursday, January 31, 2019 at home. Visitation will be 5:00 PM – 7:00 PM, Thursday, February 7, 2019 at Denton-Wood Funeral Home. Funeral services are scheduled for 2:00 PM, Friday, February 8, 2019 at First United Methodist Church with Pastor Dan Boyd officiating. Entombment will follow in Sunset Gardens Memorial Park, Carlsbad, New Mexico. Denton-Wood Funeral Home oversees all arrangements. James A. Moutray was born February 14, 1930 in La Mesa, NM. He attended grade school in Lakewood, New Mexico and graduated high school in Artesia, New Mexico. He went to New Mexico Military Institute in 1949-1950 and graduated from New Mexico State University in 1952 with a B.A. Degree in Agriculture. In 1952, James lived and worked at the family-owned Seven Rivers Farms. During his time there, he embraced the farming and ranching business and in 1956, he proudly planted pecan trees. James met Darlene in 1957 at the Bowling Alley in Carlsbad, NM where they began dating. After a short while, Darlene says to James, "You don't talk much, do you?" James replied with, "I don't believe in talking unless I have something to say." James and Darlene married September 1, 1959 at First United Methodist Church. They had two sons: Terry, born in 1961 and Pardue, born in 1963. They lived at Seven Rivers until 1964 when they then moved to Managua, Nicaragua, Central America. James managed and farmed cotton in Managua for three years. They moved back to New Mexico in 1967 where James continued to farm cotton and alfalfa at Seven Rivers for several years. In 1973, James left Seven Rivers and began his own business, J. M. Farm & Cattle Co. He ran a farming operation at Harroun Farms for 19 years in Malaga, NM where he farmed more cotton, alfalfa, and raised cattle. During that time, James and Darlene built their "forever" home in 1979 on W. Riverside Drive in Carlsbad, NM. Around 1992, he relocated his business to Fort Stockton, TX and continued farming for the next 9 years. In 2001, James retired from farming and started a new career as a realtor at Dunagan Associates until 2015. James continued part-time in realty providing property assessments to various realtors in the region and officially retired in April 2018. James is survived by his sons: Terry and Pardue Moutray; grandchildren: Stephanie Moutray, Amanda Christon, and Elaine Moutray; brother: Jim B. Moutray, Jr.; sisters: Margaret Marchiondo, and Mildred High; and his great-grandson Rylan.